You might spend a lot of time outdoors or you may not. But your outdoor decking is there year-round. It is attacked by the elements, tolerates foot traffic, puts up with the weight of the furniture, and is hardly protected. Depending on the deck construction and material, it might serve you for 15 or 20 years or maybe more before it screams for some repairs. But it wouldn’t hurt if you had it checked every spring. It’s all about your safety. And here we’ll explore the deck safety concerns and will also offer a few tips on how to avoid tears. Thousands of people get injured annually. To avoid accidents in your home, you need to remain vigilant to possible failures and inspect the deck before you let the children dance on it or invite the whole office for dinner under the stars. Which are the usual culprits? Let’s see. The main deck construction depends on the supportive posts, which if damaged or improperly installed will bring the structure down. Problems with erosion and leaks are created when the flashing is improperly installed, is missing, or becomes damaged. Fasteners keep the structure together. If they get rusty or loose, there will be a deck failure. Deck railing systems might loosen up over the years or might fall due to their bad installation. It’s easy to get injured, especially since most people tend to lean over the railings. Not all wood decks are insect resistant. Some wood species won’t hold well under the sun’s heat or in humid regions without proper maintenance. Wood might crack, split, and wear. 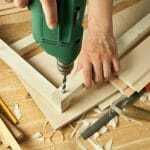 In short, wood can be damaged and when it does, it might break causing an injury or bringing part of the structure down and thus become the reason for a serious accident. The stairs of the deck are still made of wood and there is still a railing which might get loosened. One step on a broken stair and you fall. Let’s start with the obvious. Check all the above or better still, have a deck company do it for you and on a regular basis. It’s not strange to have problems but it will be a shame to get injured because you underestimated the importance of maintenance. Another major concern is deck building. Avoid doing it yourself but always hire a professional company with a long experience in the sector and good recommendations. This will help you avoid problems due to a bad construction and installation. 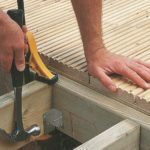 Apart from calling a deck contractor to check the fasteners, keep your eyes open in case you see any rusty screws or nails. It’s good to know that screws hold better the beating than nails but must be rust resistant. Pay special attention to the railings. First of all, you must have such a system if your deck is over thirty inches of the ground. To better protect toddlers, make sure the space between the vertical posts is four inches maximum. Needless to pinpoint the importance of checking the stability of the railing often, install a system that can withstand great pressure, but still avoid leaning on it. If you don’t like the idea of maintaining wood, get composite decks. If you already have a wood deck, it’s best to have it checked, cleaned, and maintained. Don’t forget that some materials might be affected by the humidity and get infested with mold. Save yourself time from inspections if you have no clue of what to look for by calling deck contractors to do the job for you. It’s critical for your safety to do that often. So, don’t neglect it even if your deck seems fine at first glance.